So Dan and I RARELY eat out. So when we do we want to make sure our money is well spent on something delicious and unique. No McDonald’s here peeps. However we do love ourselves a good burger every now and then. We are all for healthful eating, but sometimes you just need some grease. So Dan’s fellow employees have been raving about a new hamburger joint called In The Buns. I could not find a webpage for them but they are on facebook here. So since Dan’s co-workers have given it a 100% approval rating, we thought we would check it out. Seeing as this is our first food review I will explain how it works in The Smithocracy. We work on the 4 star rating system. Since there is 4 of us, one star per person. So if only 1 Smith likes it, it gets 1 star, 2 Smith’s, 2 stars, and so on and so forth. So lets dive in shall we. 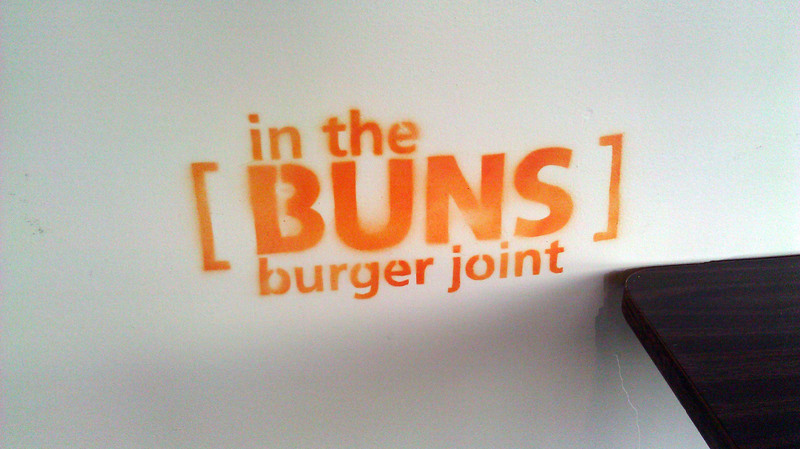 In the Buns is located here and has been open for about two months. Now the Graphic Designer in me likes the logo going on in here and the execution, very fun. But the mother and wife of all males began to grow tired of the name and all the boy jokes that went with it. But I digress. The place is obviously set up on a shoe string budget. Having a brother in the restaurant business, I know how expensive it is to get a place up and running. So I had to admire the creative ways they took shortcuts to get the look they needed. The spray painted logo, the cool chain fence kitchen and hand drawn restroom signs were great touches. The staff was friendly and all said “hi” when we walked in. On the menu is hamburgers of course, there were other items, but Dan made me go hamburger or go home. So here were our choices. Last but not least was The Fire Burger. This one is NOT for the faint of heart or tongue. It contains The Trifecta of peppers. Ghost, habanero, and serrano peppers. So this gringo steared clear. 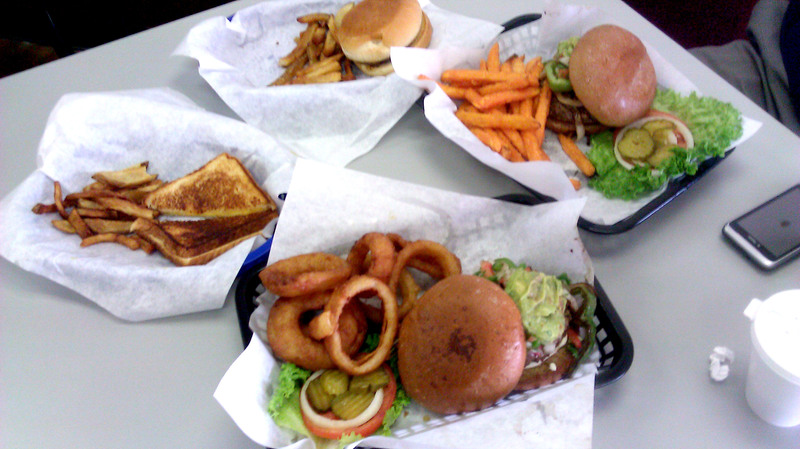 Dan and I both ordered the Fajita Burger, Onion Rings and Sweet Potato Fries. Yes we really wanted to clog our arteries in a major way. Austin got the Kids Burger and Logan, the kidsToasted Cheese. We went to the soda fountain and found this. If you are a soda connoisseur as Dan is. Then you will be just as happy as Dan and my kids were to find such a delicious selection of soda. I, for one, am a water drinker. But I do admire a fine rootbeer, and that was a fine rootbeer. Holy guacamole Batman. That is a lot of food. 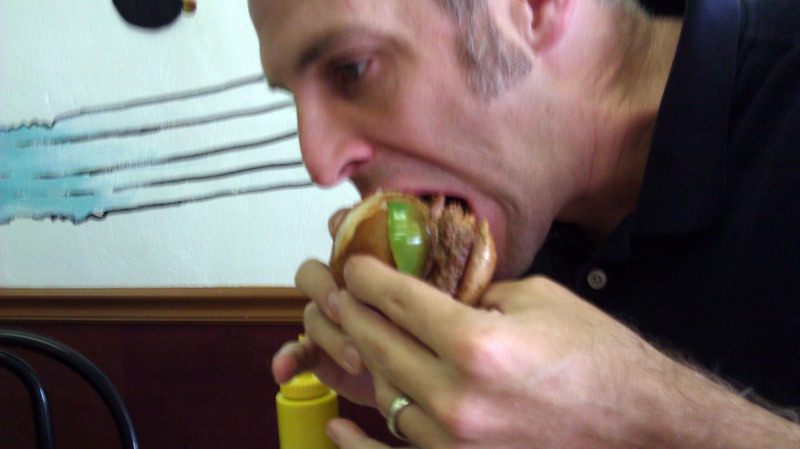 I put my burger together and took my first bite. Very good and there is a surprise inside. The cheese is in the patty, which was cool. The kids got a kick out of that. Now let me explain a little about my hamburger tastes. The best burger in the world to me is P. Terry’s and right behind is Phil’s Icehouse. I will review those in the future, but here is a hint. Best burgers ever. Anyway the burger I had was huge, greasy and messy, just as a good burger should be. And it was good, but not P. Terry’s good. I place it below Phil’s and above 5 guys. So still a VERY good burger. So I give it 1/2 a star. Here is Dan’s take as quoted from his facebook post. That’s right Dan, get that burger in your face. So a star from Dan. Austin gives his approval and a whole star. Logan also gave it a star, but his picture didn’t turn out. 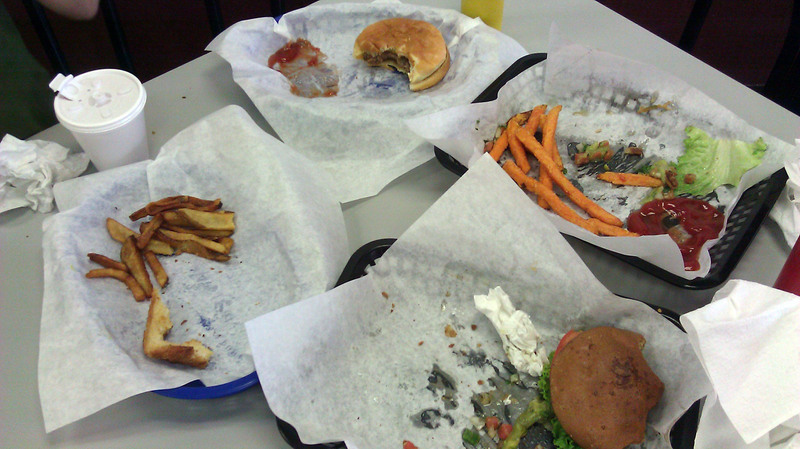 :-( I will tell you that as a parent, Austin did not finish his burger, but did finish Logan’s toasted cheese. 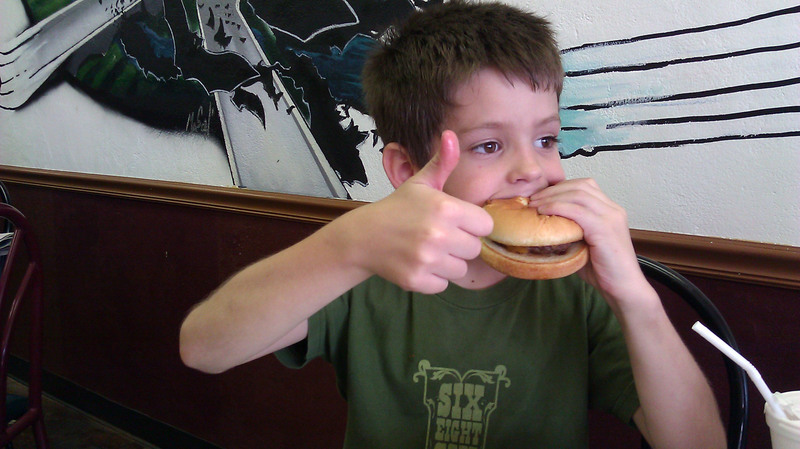 I took a bite of his burger and they definitely do not specialize in kids burgers. But both kids agree that the toasted cheese was delicious. So if you go, I say get the kids either a grown up burger and make them share, or go with something other than the kids burger on the kids menu. Here is the damage done. Did I mention that the burgers are HUGE! That is the only reason why mine is not finished. My stomach can only hold so much. Also I can’t forget to mention how yummy the onion rings were. Those were amazing! 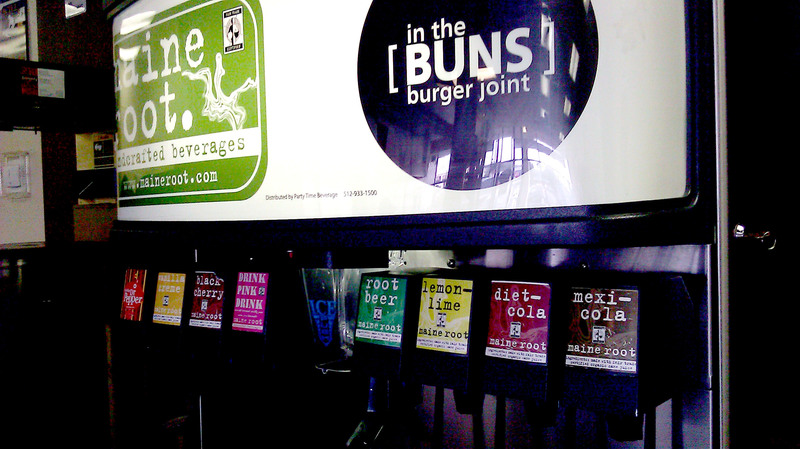 To sum it up, In The Buns is a great little hamburger joint and your taste buds will not be disapointed. Although your arteries will hate you for a week after. So check it out and bring some wipes. The Smithocracy voted and it is 3 1/2 stars. Do you have any food recommendations for us to check out? Let us know on our facebook page or here in the comments and we will review it for you. Happy eating! Stay up to date by email! Unauthorized use and/or duplication of this material without express and written permission from this blog’s author and/or owner is strictly prohibited. Excerpts and links may be used, provided that full and clear credit is given to Tannie Smith and The Smithocracy with appropriate and specific direction to the original content.